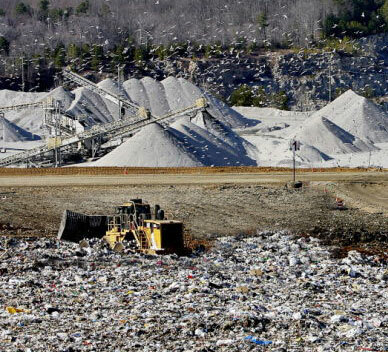 The folks at Shoosmith landfill are applying for DEQ permission to use the Tarmac rock quarry, once it is completely used up, for additional space to add to their landfill. The quarry could be nonfunctional in a few years once the company takes the last bit of stone they can economically haul out of there. At that point it will make sense, according to Fletcher Kelly, president of Shoosmith to use the quarry for addition fill space. Shoosmith received a permit to build a berm in three phases, which would allow additional fill space, but the company has completed the first phase and has decided not to complete phase two and three. A public meeting will take place on July 28, to seek public comment on a draft permit from the Department of Environmental Quality regarding a sanitary landfill in Chesterfield. According to a legal advertisement published last week, there will be a public comment period from June 27 to August 11. The public comment meeting will take place at 9501 Lucy Corr Circle, in the Smith-Wagner Building located in Chesterfield Government Complex on Tuesday, July 28, at 7 p.m. The expected life of the requested addition landfill space should last 15 to 19 years depending on the future waste intake rate. The landfill will include a collection system for accumulation of groundwater that may accumulate below or along liners. All comments must include the name, address and telephone number of the person commenting and be received by DEQ within the comment period. DEQ also accepts written and oral comments at public hearings. The public may review the draft permit and application at the Chesterfield County Central Library at 9501 Lori Rd in Chesterfield. Details: Mr. Josh Byerly; Piedmont Regional Office, 4949A Cox Road, Glen Allen, VA 23060; Phone: 804-527-5173; E-mail:Josh.Byerly@deq.virginia.gov; Fax: 804-527-5106.